The two latest reviews from Mezco on their Toy Fair product review is none other than #2 MDS Batman '66 last Monday and this past Monday's #3 One 12 Captain Marvel! 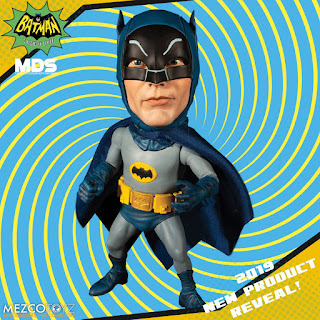 Obviously, Adam West's Batman still has a huge following, and this MDS product captures the look brilliantly. The fabric cape looks just amazing. 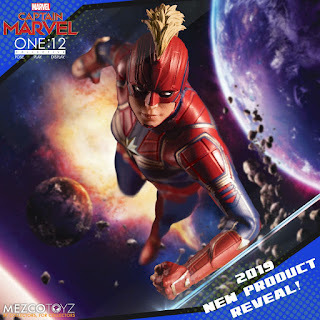 As far as the One 12 Captain Marvel, she's an absolute must have with the new movie coming out to theaters soon. I love how they they decided to show her with her helmet on despite all the movie promos showing the lovely Brie Larson minus the helmet. As with most One 12 figures, I expect swappable heads to give us a variety of choice as Mezco always does. Which are you most excited about?! See their fourth and final review on February 11th here.